Hotel in Lebec Is a Great Mountain GetawayBordering gorgeous Los Padres National Forest with Mt. 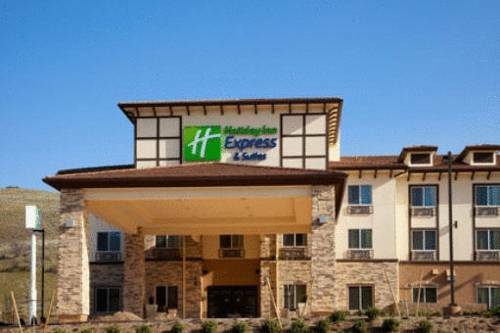 Pinos resting in the background, the Holiday Inn Express� Frazier Park is ideal. Our hotel's central location between L.A. and Bakersfield and minutes from important sites like Tejon Ranch offers you convenience.While in Lebec, our hotel's guests enjoy a wide variety of activities. You can go cross-country skiing or snowshoeing in Frazier Park, star gazing at Mount Pinos or hiking at Hungry Valley State Recreation Area in Gorman. There are also festivals throughout the year, such as the Mountain Shakespeare Festival and Fiesta Days. Don't forget to check out the Civil War reenactments at Fort Tejon Historical Park, too.In case you're stopping here to recharge before meetings in L.A. or Bakersfield, we have a Business Center with print and copy services. We also offer free high-speed, wireless Internet access. And if you need to hold a small gathering in the Frazier Park area, our hotel's event room can host up to 50 guests.You can start your morning in our Fitness Center, then enjoy the complimentary, hot Express Start Breakfast Bar, which features 100% Arabica bean coffee and our signature cinnamon rolls. After a long day at Tejon Ranch, you can unwind in the bubbling whirlpool or on a plush, triple-sheeted bed. Stay with us on your next trip to Lebec, and our hotel's comfortable rooms and convenient location will leave you satisfied. Meeting Room can be set up theatre style, classroom or boardroom. We can hold up to 20 people in the meeting room. Statues of cancer patients run towards and leap through "gates" of treatment and recovery. This strange tableaux has been duplicated in dozens of other cities. History of Taft and a region once dotted with 7,000 wooden derricks. Outdoor derrick, equipment...site of the largest rodent infestation in US.